Tips For Removing Snow From Roofs! Snow buildup can place a significant weight load on your roof and potentially cause damages such as roof leaks and even collapse! How much snow is too much, and how should it be removed? This time of year it seems like we are getting snow storms every other day. This snow piles up and can cause damage to your property, including your roof. Waiting for Spring to melt the snow may not be an option and you may have to take measures to protect your home and yourself. 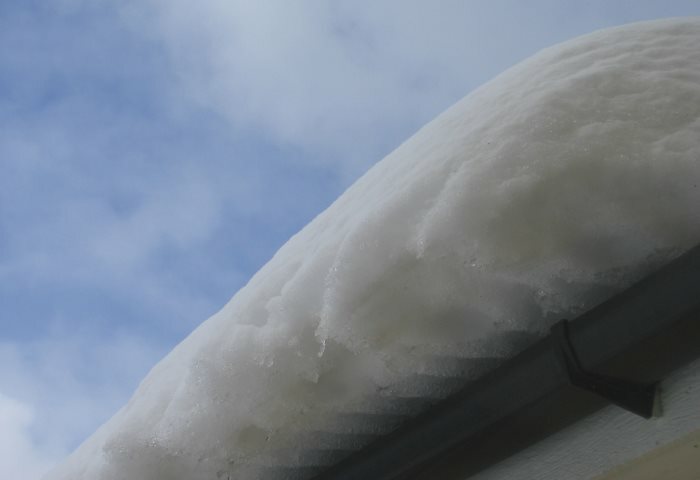 There is a lot of snow on your roof, but how much is too much? Is there a danger of the roof collapsing? With a home that is built to current code, probably not, but if there was un-permitted work done to the home, or structural components are already weakened, there is a possibility. A large amount of heavy, wet snow could cause problems however so, check the interior of the home to be sure. If there is a problem, you will notice the doors in the interior of the home sticking and possible cracks in the plaster or drywall around the door frames. This is caused by the weight of the snow on the structural beams actually twisting the home. If you hear any noises, such as creaking, leave the premises immediately and call a professional. Roof collapse is not the only damage that can be caused by excess snow build up on the roof. Ice Dams are also a major concern, which can cause Water Damage in the interior of the home. An ice dam is when there is ice buildup in the gutters and the snow behind the ice on the roof melts. There is nowhere for the water to go except under the shingles and into the home. If this has occurred, it is recommended that you call a professional water damage mitigation company to check the interior of the building for trapped and hidden moisture. Water stains on drywall are an indication that moisture is also in the ceiling or wall cavity and this should be addressed to eliminate the possibility of Mold Contamination. If you determine that snow removal is necessary, the safest way is to call in a professional. There are many dangers to attempting snow removal yourself. While the most obvious danger is the possibility of slipping off the roof and falling or slipping on the icy rung of a ladder, there are other hazards to consider. Hidden openings and skylights have been known to give way when stepped on and cause serious injury. There is also the danger of the added weight of a person to the weight of the snow. If the extra weight is too much for the roof, it will collapse. For steep roofs with many gables, a professional should always be considered necessary. They are aware of the dangers and have fall protection equipment that keeps them safe. The only safe way for the homeowner to remove snow from a roof is to keep both feet planted on the ground. There are many different roof rakes on the market to choose from and if your roof is low enough, this may be an option for you. Just be careful not to pull the snow off the roof and onto yourself or anyone else on the ground. You also do not want to scrape the shingles with the rake, you could damage them, leave a protective inch or so of snow between the rake and the roof. Remember, you only need to remove the excess snow, not clean the roof entirely. Once again, the safest way to remove snow on your roof is to call a professional but, if you insist on doing it yourself, take all precautions to ensure your safety. We hope you found this information helpful! Should you ever suffer Water Damage in your home, please don't hesitate to Contact The Experts!